BCB Gummies takes us on a thrill ride back to the candy gummies we have all enjoyed. A handful of gummy candy with every puff. Unfortunately you can’t pick all of the reds out in this case but you’ll certainly find the flavor you love in this one. 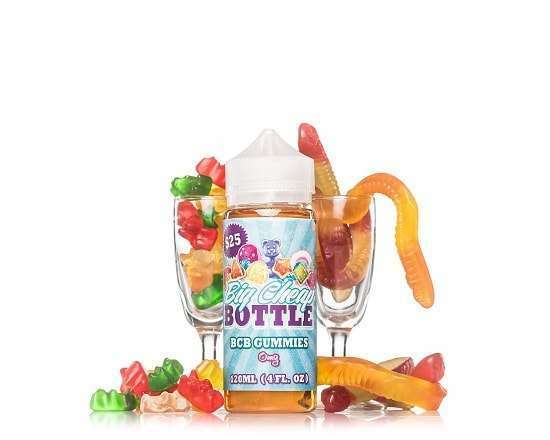 BCB Gummies eliquid by Big Cheap Bottle is a delicious mixture of mixed berry gummy worms and gummy bears. Taking two classic gummy-shaped candy and blended into an eliquid, will make your mouth-water for more. Big Cheap Bottle Gummies ejuice provides a sweet gummy candy on the inhale with subtle notes of tang on the exhale. Packaged in 120ml Chubby Gorilla unicorn bottle.